Its amazing how many different "personal" or "minimum","emergency" or "survival" kits (PSK) lists there are in existence. Every bushwalking book seems to have a different one. Try A Google search.... I found hundreds of thousands of references. Try searching YouTube and you get 68 videos showing how to put one together. Why are there so many when they all aim to provide water, fire, food, shelter in an emergency? Of course, many of these references are not entirely relevant to bushwalkers, who have to carry whatever is in their kit and therefore must make savings in both weight and volume. So why is there no universal list for bushwalkers? Well some items do seem to appear in all lists, in one form or another, but the inclusion of others depends on the priority you give to provision of water, shelter and food or whether your focus is upon thermal regulation, hydration, and signaling. Perusing an equipment list from the 1965 edition of 'Equipment for Mountaineering' published by the Melbourne University Mountaineering Club we find a whole lot of items that the modern lightweight and minimal impact walker would never carry or which have been replaced by better alternatives. What changes are needed after all these years? Now you have the kit, what sort of container should you keep it in? A lightweight waterproof bag or perhaps a light weight metal container that can also serve to heat water in? Perhaps you could combine your PSK with your personal first aid kit. Where will you keep it? On your person at all times! Ever fallen down into a creek going for water or got lost going to the loo.... some people do? This kit is designed to be carried on you at all times and to supplement things that you would normally carry in your clothing or on your belt. How to build your own home made survival kit. 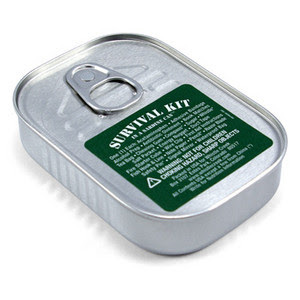 Want a "real" wilderness survival kit? I think the debate over which is better; matches, mag flint or cigarette lighter will go on forever. Personally I find the cigarette lighter gets your thumb too close to the igniting flame. Apparently NATO waterproof matches work best; but where can you buy them in Australia. Thanks for this post, it's excellent.